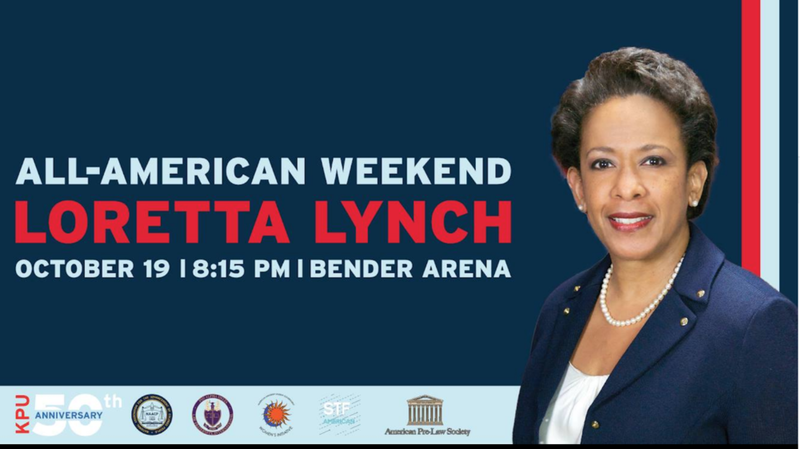 The Kennedy Political Union has invited former U.S. Attorney General Loretta Lynch to speak for this year’s All-American Weekend. She will speak about “Empowering the Next Generation of Change Agents”, and other issues that directly impact our society today. KPU collaborated with Women's Initiative, NAACP, American Pre-Law Society, Phi Alpha Delta and She's the First to bring Lynch to American University. Lynch will speak on Oct. 19 at 8:30 p.m. in Bender Arena. Doors open at 7:30 p.m. Admission is free to all AU students with a valid school ID, but will be provided on a first-come, first-served basis. Guests can purchase tickets through the registration site. Loretta Lynch was the first female African American attorney general of the United States. Much of her time as attorney general was spent overseeing issues relating to police misconduct in cities like Ferguson, Missouri and Baltimore, Maryland. Lynch was born in Greensboro, North Carolina and graduated from Harvard Law School in 1984. She began her career practicing law in New York, and progressed from a federal prosecutor to serving as the United States Attorney General for the Eastern District of New York. On Nov. 8, 2014, she was nominated by President Barack Obama to serve as the 83rd Attorney General of the United States, making her the second African-American and second woman, but the first African-American woman to be confirmed for the position. She was sworn in as attorney general in 2015 and served until 2017. The event will be a great opportunity for AU students to feel empowered and motivated to become the next generation of movers and shakers. It is important, now more than ever, for students to start being the change they want to see instead of waiting for it.